RT has warned of a possible plot being fomented by Syrian rebels inside NATO member Turkey. The plot involves Syrian rebels deploying chemical weapons obtained in Libya against Syrian civilians, then blaming the Syrian government for the mass casualty event. This of course would provide the West the “casus belli” it has been searching for to circumvent the UN Security Council and implement its long-planned campaign of regime change. Libya’s arsenal had fallen into the hands of sectarian extremists with NATO assistance last year in the culmination of efforts to overthrow the government there. Since then, Libya’s militants led by commanders of Al Qaeda’s Libyan Islamic Fighting Group (LIFG) have armed sectarian extremists across the Arab World, from as far West as Mali, to as far East as Syria. Libyan LIFG commander Abdul Hakim Belhaj, according to the London Telegraph, had in fact traveled to the Turkish-Syrian border to consort with the so-called “Free Syrian Army” (FSA), pledging weapons, cash, and even fighters. Since then, at least one ship flush with Libyan weaponry bound for Syrian militants has been interdicted by Lebanon, while the Western press, including the Sydney Morning Herald, has reported on a massive influx of foreign fighters and arms. In addition to Libyan weapons, the Washington Post has also confirmed the US and Gulf States have been arranging the delivery of weapons to Syrian militants. Clearly, NATO’s proxies in Libya have become a regional arsenal for similar sectarian extremists – all demonstratively working in concert with Western designs to overthrow both nationalist governments in North Africa, and installing client regions throughout the Middle Eastto then array against Iran and by extension, Russia’s sphere of influence throughout the region. If Libya possessed deployable chemical weapons, it seems very likely that they would find their way to LIFG’s affiliates and their foreign legionaries along with the rest of their exported terror. There is certainly room for plausible concern regarding all types of Libyan weapons falling into the hands of the Free Syrian Army. They have been publicly pledged by LIFG commander Belhaj, and they have been interdicted en-route by neighboring Lebanon. Does evidence also suggest that indiscriminate mass-casualty attacks could be carried out by the FSA and then blamed on the Syrian government, should they be “gifted” with Libya’s chemical weapons? 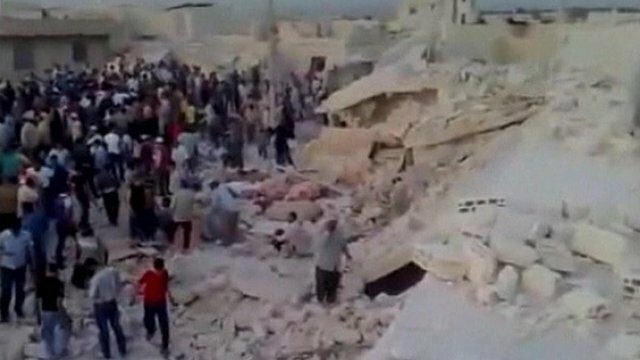 In Reuters’ April 2012 article, “Outgunned Syria rebels make shift to bombs,” it is admitted that Syrian rebels have openly begun carrying out a terrorist bombing campaign, including operating large bomb-making facilities, not unlike the one in Hama which exploded during a mishap, killing over 70 people, and leveling a city block. Very tellingly, the opposition, fully responsible for the catastrophic loss of life, immediately blamed it on the Syrian government, claiming the wide scale destruction was caused by a Scud missile attack. Photo: From Hama, Syria, a city block lies in ruins after a rebel bomb factory mishap caused a massive explosion. At least 70 have been reported killed. In initial attempts to spin and cover up rebel involvement, BBC actually ran with an opposition explanation suggesting the Syrian government fired “SCUD missiles” at Hama. It is now revealed that the rebels are indeed operating bomb factories across Syria and indeed carrying out a terrorist bombing campaign. The FSA bombing campaign itself has also killed and maimed hundreds of Syrians, mostly civilians – and astonishingly despite openly admitting to producing and deploying bombs, rebels have then denied responsibility for the subsequent explosions and inevitable civilian death tolls, blaming it instead on the Syrian government. RT’s report also made the point of reminding readers of a recent attempt by rebels to have a UK Channel 4 news team killed by government troops for propaganda purposes, while German newspaper Frankfurter Allgemeine Zeitung (FAZ) has come forward with evidence (Google English translation here) implicating rebels as having staged the now infamous “Houla Massacre,” themselves – again for propaganda purposes. For an opposition so transparently dishonest, and already caught attempting to frame the government for mass-casualty events and atrocities of their own doing, we see what is very clearly a militant movement capable of also deploying weapons of mass destruction more than within their means of obtaining, with the insidious motivations to use them against civilian populations as they have their indiscriminate bombings, and the audacity to then blame it on the Syrian government. While RT’s report remains unconfirmed, it is at the very least very plausible. By airing the story, RT may be preempting malicious interests contemplating such a ploy – realizing that the public is now fully inoculated to this propaganda and that it would only backfire on both the already faltering FSA, and their increasingly discredited Western sponsors. Editor’s Note: The point of this article is to NOT be right about this. By raising awareness of possible gambits throughout the public, their effectiveness as a tool of propaganda is greatly diminished, and therefore lowers the probability that they will be considered, let alone carried out.